Staff Attorney Peter Kamakawiwoole is a member of HSLDA’s litigation team, which helps homeschool families who are facing legal challenges. He and his wife plan to homeschool. A Missouri county circuit court dismissed truancy charges against homeschooling mother Jacinda Haberly (all names changed to protect privacy) on January 31, 2013. In September 2012, Jacinda Haberly withdrew her 8th and 5th grade daughters, Karen and Miranda, from public school. Although Missouri law does not require homeschoolers to provide any notice when they begin homeschooling, Haberly opted to send a homeschool notification letter to the superintendent anyway, and joined Home School Legal Defense Association. Haberly began homeschooling her daughters the next day. Letter from Prosecutor: "Arrange Appointment to Meet"
“It has been brought to my attention that you claim you are home-schooling your child …. As with other cases regarding home-schooling, I am requesting that you contact me by phone to arrange an appointment to meet. I will be asking you to bring the appropriate documentation required by law to show that you are within the guidelines for home-schooling." Attorney Woodruff also defended the Haberly family’s educational choice to homeschool against the underlying bias of the prosecutor. Although Attorney Woodruff continued to defend Haberly, the prosecutor was not satisfied, and she threatened to open a truancy case against the family. In November, Jacinda Haberly received a summons to appear in court for truancy charges. Litigation Attorney Peter Kamakawiwoole wrote HSLDA’s motion to dismiss, arguing that the prosecution was both barred by state law and was premature. Haberly had already furnished the prosecutor with up-to-date attendance records showing that her children were currently attending school, which is a legal defense against truancy under the laws of Missouri. Additionally, Missouri homeschoolers have a full calendar year from the day they submit their homeschool notification letter to teach the required 1,000 instructional hours. HSLDA argued that the prosecutor had brought charges against the Haberly family without giving them enough time to prove compliance with the law. At this point in the school year, she could not claim that the Haberly children would not finish the required hours before next September. After reviewing HSLDA’s motion to dismiss, the prosecutor asked the court to dismiss the truancy charges against Haberly. 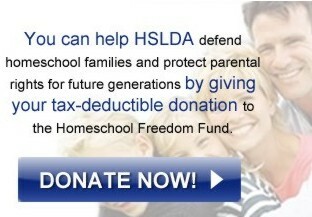 Our continued defense of homeschooling families across the nation would be impossible without your continued support. Thank you for your prayers, your membership, and your support for HSLDA.